About the Hike: The farthest point reached by the Lewis and Clark expedition was not at the mouth of the Columbia River, but rather 20 miles south at Tillamook Head, where they went hiking in search of whale blubber. Today a section of the Oregon Coast Trail in Ecola State Park follows the explorers' route to the dramatic, thousand-foot cliff of Tillamook Head, overlooking craggy islands. The route passes a viewpoint that made even Captain Clark exclaim in wonder. Getting There: Drive west from Portland on Highway 26 to the Oregon Coast. Turn left on Highway 101 for 3 miles, take the north exit for Cannon Beach and follow Ecola State Park signs, keeping right for 2 miles to the park's entrance booth. Turn right at the booth for 1.5 miles to the Indian Beach picnic area parking lot. Fees: A $3 day-use parking fee is collected at the park's entrance booth. Hiking Tips: The wide, graveled trail starts on the right-hand side of the Indian Beach parking turnaround. After 100 yards keep left at a fork and climb, steeply at times, through old-growth spruce and alder woods. After 1.6 miles you'll reach an X-shaped trail crossing beside three open-sided shelters and a primitive camping area for backpackers. The shelters and tent sites are available for free on a first-come, first-served basis, but there is no drinking water nearby. Turn left at the trail junction for 0.2 mile to find a 6-room concrete bunker that housed a radar installation in World War II. 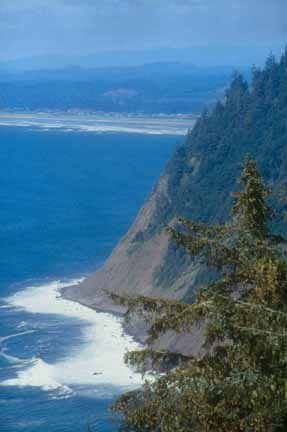 Just beyond is a cliff-edge viewpoint at the tip of Tillamook Head, breathtakingly high above a rugged rock beach. A mile to sea is Tillamook Rock, a bleak island with a lighthouse that operated from 1881 to 1957. Nicknamed "Terrible Tilly," the light was repeatedly overswept by winter storms that dashed water, rocks and fish into the lantern room 150 feet above normal sea level. The island was finally bought by funeral entrepreneurs who bring in urns of cremated remains by helicopter. After visiting the cape's tip, return 0.2 mile to the trail crossing. If you'd like to see an even better viewpoint ("Clark's Point of View"), you could detour to the left for half a mile. Otherwise, complete the loop back to your car by going straight at the trail crossing. This path is a well-graded, abandoned road that descends 1.6 miles back to the Indian Beach parking lot. History: Captain Clark, Sacajawea and a small group of men from the Lewis and Clark expedition crossed this formidable headland in 1806 to buy the blubber of a stranded whale from Indians at Cannon Beach. At a viewpoint along the way Clark marveled, "I behold the grandest and most pleasing prospect which my eyes ever surveyed." Geology: Tillamook Head is a tilted remnant of a massive, 15-million-year-old Columbia River basalt flow. Incredibly, the lava welled up near Idaho, flooded down the Columbia Gorge, and spread along the seashore to this point.